Storm windows are a type of window that is created from a single paned existing window by simply putting a piece of glass between the inner and outer parts of the existing window. By doing so, the window is transformed to serve as a strong buffer in between the violent weather condition outside and inside the home. This added glass, called the storm window pane, increases the insulation efficiency of the original window of insulation. The outside and inside panes trap the cold and hot air and prevent them from getting inside the home. In the same manner, they prevent the air inside from getting out of through this window. 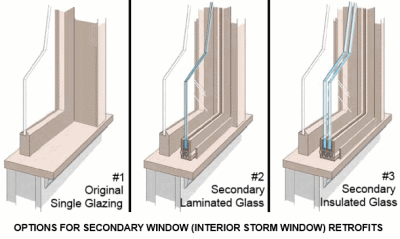 A standard storm window is not custom-fit to the existing window and thus while it limits entry of hot or cold air, it does not serve as a sound proof window and is not noise-free. Storm windows are installed to protect the home against the elements and insulate it to make it cooler during summer and warmer during winter. Mounting can be done inside or outside the glass using materials like plastic and glass panels and sheets. The interior type of this window can be easily attached and detached. It serves to minimize air infiltration by sealing tightly the primary window. The exterior kind is installed over the existing window creating dead air and a layer of glass in between the windows. It serves to prevent debris, noise, and draft from the home. Some have weep holes below the frame to catch moisture and drain. Both windows reduce the energy costs by 50% and is thus an economical and wise investment of homeowners. Cost, durability and effectiveness of this type of window depend on the materials used to create the window. The least expensive is made of plastic. However, compared to glass, windows made of this material can be easily scratched and does not last long. Those made of laminated glass and polycarbonate plastic is sturdy and more resistant to cuts or breaks. They provide more protection from storm and even intruders. Gorell 1000 Series – This product line uses frames from commercial grade sturdy aluminum. It comes in various window styles like picture, double-hung and sliders and fashionable colors of brown, almond and white. It offers a choice of obscure glass for those who prefer more privacy. Its designs and style choices match most of the look of the original windows so that blending is made more convenient. Most of the windows in this series pass the EnergyStar ratings. Kaufmann Storm Windows – these are of the exterior mounted type of windows. They use T-5 aluminum frames that need less or no maintenance at all. They are made of glass with Low-E metallic coat that helps improve energy efficiency and minimize the negative effects of UV to the interior’s finish. Available in slider, single hung and double-hung styles, these windows come in various colors like red, white, green, bronze and black. Larson Gold Series – considered the premium series of the company, these are externally mounted and cover the entire existing window. They use frames made of intensely tempered T-6 aluminum that make them strong and durable. All have sash that are weather-stripped on both sides for an increase thermal efficiency and protection from a draft. They come in five different models with the following colors: almond, white, sandstone, and earth tone brown.